I HATE cleaning. Let me say that again. I HATE cleaning. However, I love having a fresh smelling and clean home. Obviously I have a bit of a predicament. Well… I’m working on getting a maid, but until that happens, I can have a fresh smelling home with my favorite new cleaning product. 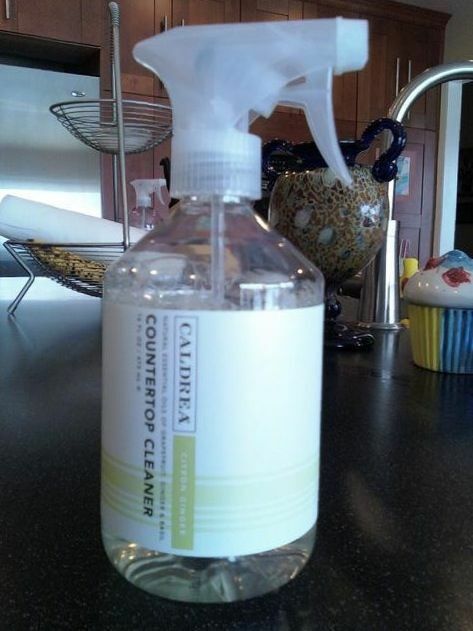 Caldrea’s Countertop Cleaner, Citron Ginger scented is keeping me quite content with it’s natural essential oils of grapefruit, ginger and basil. I actually look forward to cleaning off all the clutter and dishes from my counter so that I can wipe up my counters nice and shiny with this spray. I found a 16 oz. spray bottle at Target for under $6. Yes, it costs a little more than Windex or Method ( my other favorite cleaning product maker ) but the wonderful aroma of ginger and citrus lingers long after I’ve swiped my counter. In fact, I clean my counter before I go on an errand run, and when I come back, my house smells lovely. Ahhh. Fresh and clean. Well, fresh SMELLING anyway– just don’t look at my floors. This site is a collection of things I enjoy. Little bite size reviews about the good stuff I come across. Stuff I hope you like as much as I do. The Darker Side of iTryiLike stuff you shouldn’t try.